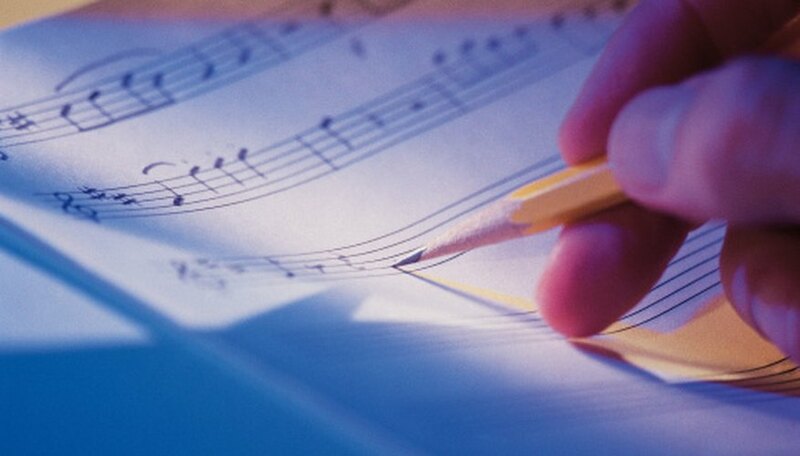 Memorization of the musical notes on a staff comprises the first, basic step in understanding music. Students must learn about the staff system and how the system of notes works in different clefs. Two main clefs, bass and treble, which together form the grand staff, are the basis for all musical notation. Depending on the clef used, notes' names vary, making it necessary to pay attention to the clef at the beginning of the staff system. Memorize the system of lines and spaces on the staff. Staff systems have five lines and four spaces. Each line and space gets a different note name. The musical notes move consecutively from line to space in alphabetical order. Learn the musical alphabet that starts with A and ends on G. When G is reached, the cycle starts over again at A. Create an acronym to memorize the lines of the treble clef. A common acronym is "Each Good Beginner Does Fine." This acronym (EGBDF) will allow you to remember the names of the lines of the treble clef from bottom to top. Remember that when you look between the lines of the treble clef you see your "FACE." Each note of the word "face" is a separate space from bottom to top. The bottom note space is F, the second space indicates A, the third note sounds C and the fourth, E.
Develop an acronym for the lines and spaces of the bass clef. "Good Boys Do Fine Always" creates an acronym that works to memorize the lines. "All Children Eat Groceries" helps to learn the names of the spaces. What Are the Musical Notes for the Bass Clef Staff?